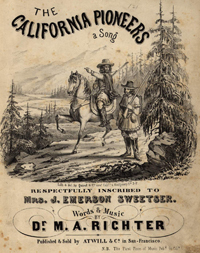 The categories in the menu at left represent an on-going effort to mine the collection for information of interest to collectors and others who want to learn about 19th-century sheet music. Clicking on a category will take you to a page providing general information about that topic, as well as links to relevant items from the various collections contained in this Project. While they are still incomplete, they do contain a fairly extensive sample of material, and using them is a good way to familiarize yourself with the music on this site. Sheet music titles mentioned in the topics are linked to their full catalog record (from Search One). You can also "browse" by going to the Browsing/Searching Cover Images or Browsing/Searching Music by Subject pages, and looking at the subjects/cover illustrations contained in the collection. Clicking on any entry will automatically take you to a list of all items in the collection with that subject/cover illustration. Search 2: Full access through the Library, UC Berkeley, formal display, with some additional features. The searches differ in both their search fields and their display of results. Search 1 allows users to combine 3 fields (use the pull-down box next to the entry box to specify search field), plus language (in a separate box) for searching. Search 1's "any word" search can also be used to find descriptive terms, such as "composer," "photographer," or "advertisement." Search 2 allows users to combine any or all of the available search fields in one search. The searches also display their results somewhat differently. For more information about Search 1, click here. Images are best viewed at a monitor resolution of 1024 pixels per inch. To print the full-size images on a 8 1/2 x 11" sheet of paper, set the printer to reduce to 70% of actual size. If your printer cannot reduce the size, set the printer to landscape; an image will print on two sheets of paper with some loss of information at the right margin. To get the best results, use a 1200 dpi printer.